Sometimes a little piece of furniture alone can bring in a world of happiness. I have always loved doing mini home projects every now and then. Usually, they are inexpensive, quirky, one-day projects that I take up after a ton of Pinterest browsing. This time around, I decided to transform old boring shoe rack. It didn’t start directly with the idea to change up the shoe rack. This last month I was visiting my in-laws, and one day I just came across this beautiful lampshade that my mum-in-law had in her collection. She was willing to part with it, and I jumped at the prospect of having it in my collection. Now, what is so special about a lampshade? Well, a, I have a weakness for all things lightings. B. It was an antique silver finish study lampshade. C. It was g-o-r-g-e-o-u-s. Need I say more? When I finally unpacked it at home, I knew I wanted to create a space worthy of keeping this treasure on display. The only possibility I had was an old boring shoe rack which was currently acting as my mini library stand in the living space. Currently, the shoe rack was acting as a mini library with some seriously boring MBA books. Can you see the problem? It’s ugly and it just had to go. But, you know me. I am a that crazy budget, conscious person. That plus, we are living in a rented apartment. It didn’t make financial sense to junk it altogether to buy a new set for the corner. So instead here was the plan to transform old boring shoe rack. I chose the balcony for the project coz of more space, less problems of cleaning afterwards. Apply a fresh coat of paint. Canary Yellow Colour. Change the contents of the Shoe Rack. Transform it into a Photo Library. What a single coat of spray paint looks like. P.S. Please note that a single can of spray paint is not enough to finish this project. It hardly has paint enough for a single layer of paint coat. So try to avoid spray paint and go for a regular wall paint. Mix the raw paint with 3-4 spoons of paint (kerosene) oil to give it a shiny lustre. Apply a think coat of paint the first time. Apply a second coat of paint. Repeat the process to let it dry. 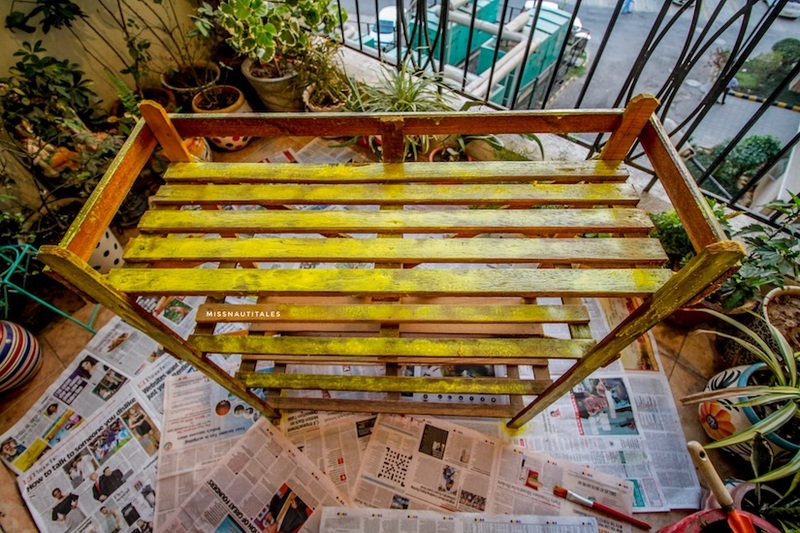 Apply a third coat wherever required till you see a bright shade of yellow throughout the shoe rack. The cube is a collection of all our engagement snaps.